The Half-Marathon. I feel the combination of speed and endurance best fits my strengths. I tend to struggle with rest periods. After marathons, I know my body needs downtime. But I’m always concerned that too much downtime will result in loss of fitness that I’ve worked so hard to gain. Finding that sweet spot for length of rest is tough for me. I wear two shoes, my trainers (Saucony Glide) and my racing flats (Saucony Fastwitch). My trainers get changed out every 450 miles, my flats every 250 miles. I don’t have a specific mantra for every race, but I usually find something that is relevant to that particular season/day/race, and that’s what I go with during the race. This may sound strange, but I rarely lose motivation. I realize that most of my goals are arbitrary, but they mean something to me. Once the goal is set at the beginning of each season, I usually have laser focus on that goal. Running brought me to my wife! It also pulled me out of a time in my life where I felt I had no purpose. Running has given me health and fitness, both physical and mental, and it’s given me something positive to identify myself with. The Boston Marathon, hands down. Originally, I began strictly to get back “into shape”, and it snowballed from there! I’d like to eventually run all 6 marathon world majors. I have two of the three in the U.S. (Boston and Chicago), so next up is NYC. That’s the one that I really want to complete at the moment. The only time I listen to music while running is on the treadmill, and especially when doing speed work on the treadmill. I like harder rock for these sessions (Deftones, Chevelle, Seether, Linkin Park, etc.). I also listen to this same type of music the morning of a race. 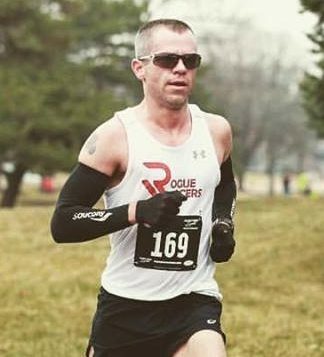 Previous Rogue of the Week – Jason H.